Accurate indoor radio positioning requires high-resolution measurements to either utilize or mitigate the impact of multipath propagation. This high resolution can be achieved using large signal-bandwidth, leading to superior time resolution and / or multiple antennas, leading to additional angle resolution. To facilitate multiple antennas, phase-coherent measurements are typically necessary. 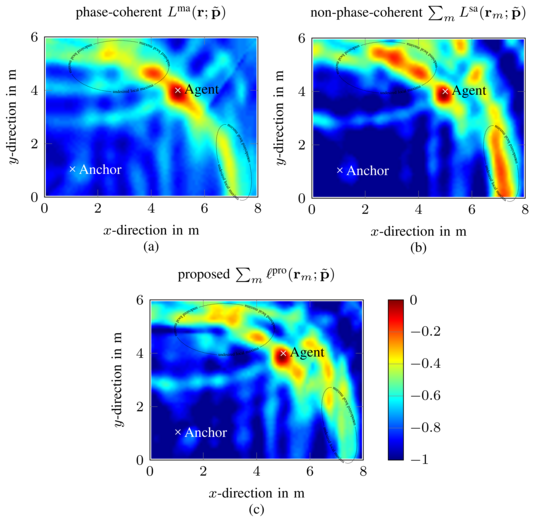 In this work we propose to employ non-phase-coherent measurements obtained from directional antennas for accurate single-anchor indoor positioning. The derived algorithm exploits beampatterns to jointly estimate multipath amplitudes to be used in maximum likelihood position estimation. Our evaluations based on measured and computer generated data demonstrate only a minor degradation in comparison to a phase-coherent processing scheme. The figure illustrates the likelihood functions, evaluated for a 2D scenario with room size 6x8m. Figures (a) and (b) present the outcome of state-of-the-art algorithms based on phase-coherent (a) and non-phase-coherent measurements (b). The proposed method (c) employs non-phase-coherent measurements and is reaching the results in (a) by suppressing undesired local maxima (see ellipses).